Seemingly everyone has already talked about Good Night, and Good Luck. from nearly every angle imaginable. And there are a hell of a lot of angles, because as trifling as the film ends up being, it's got a lot going on. For one thing, (and I'm going to start with the purely cinematic), it evokes the 1950's like nobody's business. Plenty of recent films have tried, and some have come pretty close. But this film leaves them all in the dust. Partly, I assume, this is because it is shot in black and white, the look that I at least associate with that decade. Partly, it is because the film is set almost entirely in newsrooms and on TV sets, and so it looks like the exact version of the 1950's that I've seen for years in archive footage. Hell, part of it is no doubt because it uses quite a lot of archive footage. The acting is all superb, which is unsurprising given the level of talent involved. George Clooney, in his second outing as a director, doesn't quite know what to do with the camera, but the stuffy staginess that marks most of the film becomes kind of appealing after a while - this is a film about television news, after all, and a certain level of stasis is honestly appropriate. Then there's the plot. 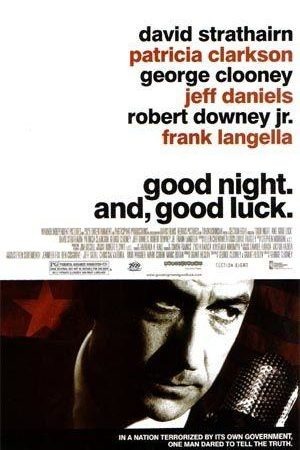 Everyone reading this almost certainly knows that the film tells the story of CBS News and Edward R. Murrow's ultimately successful quest to topple Senator Joseph McCarthy during the height of the Communist witch hunts. A story that it tells well, I might add; I really can't speak to the veracity of every little point in the film, but it seems fairly objective and balanced (which is to say, McCarthy seems like an insane hellbeast, but it's not hagiographic towards Murrow). 1) Journalists today lack the iron will and integrity of journalists in the 50's. 2) Specifically, journalists lack the balls to go after Bush and company for a wholesale stripping of civil rights the likes of which we've not seen since the 50's. Which is of course fine, but the movie starts to suffocate under the weight of having to bear the moral fiber of all America on its back. I don't mind the themes at all, but they do get in the way of the story, which ends up being very clinical as a result. I guess I was looking for something like All the President's Men - a journalistic procedural that's taut and exciting as hell. Instead, it's more like a very magnificently constructed civics book.